This semester I’m teaching a half credit course on digital citizenship. I didn’t design the course. I’m actually somewhat limited to the changes I’m allowed to make. 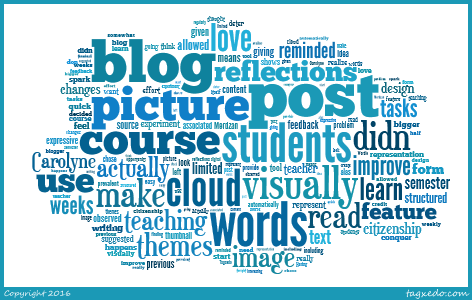 The course is well structured, and I’m loving the opportunity to read my students weekly reflections in the form of blog posts. Having a blogger as a teacher means that I’m regularly giving them feedback on how to improve their blogs. This week one of the tasks they were given was to create a word cloud. 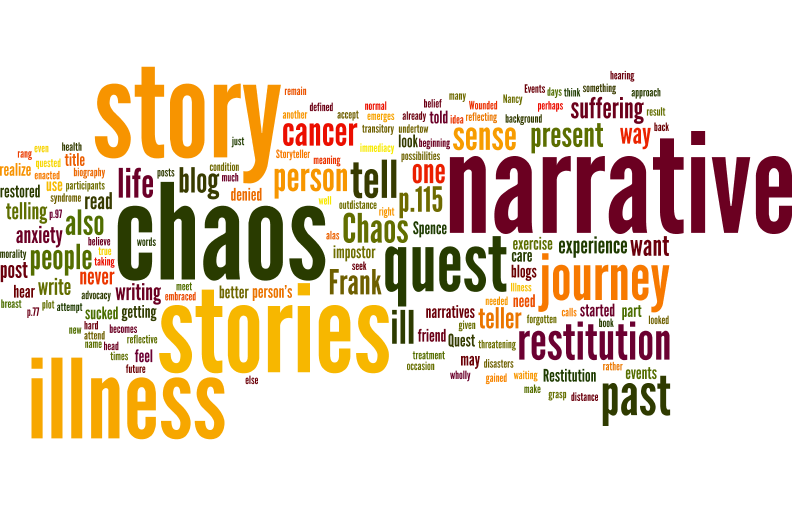 Several of my students decided to use the previous weeks post as their source content for their word cloud. One student then observed that “I was able to experiment with this tool to visually represent words and I find it much more interesting and expressive to look at compared to reading the actual words of the post itself.” Merdzan, C (2016). Carolyne’s reflection reminded me of something that I read in one of the many “how to improve your blog” posts. It suggested that every blog post should have a picture associated with it. Many of the themes now have the idea of a “feature image” that shows at the top of your post and is used as a thumbnail if you have a visual theme. My problem was that I really didn’t want to have to go through the effort of finding a picture for every post. I don’t think visually. I don’t feel the need to have a picture for my text. The task itself of finding a picture would only be something that would deter me from writing. So I left it. I decided that I’d just chose themes that didn’t need feature images. I’d go without. But alas, Carolyne’s post make me realize that I could use a Word Cloud (Wordle or Tagxedo or Tagul) of the text in my post as the image for the post. The Wordle or Tagxedo will automatically make the most prevalent words bigger than the others. It will provide a quick and easy visual representation for the blog post. And so, with that, I’m going to start including a Word Cloud with every post. I’m reminded why I love teaching – because I learn from my students. That and I love to see the spark that happens when they conquer learning something they thought they’d never be able to learn. Visual aids help set the tone for all writing. This is something we first learn in childhood, but tend to forget as adults. Great post Rebecca. Something to consider suggesting with our students so they themselves have a choice of including visuals. Thanks for sharing.